Running a SC truck on oval carpet/blacktop and wondering which would be a better choice, ball diff. or gear diff. Interesting you mention that. Ran on a dirt oval last night, great fun. Took my offroad b5m, didn't alter a thing and ran it. I am thinking about finding a used buggy for just that. Truck would probably be better because it is tougher. As far as diff goes, I am not qualified to answer. You'll grind the ball diff to a pulp in a hurry on that kind of surface and the gear diff is generally going to be the diff of choice for any kind of carpet racing. Funny you mentioned this. I was just getting my oval cars ready after years of collecting dust. A new track just opened up close by that will be running carpet oval. I have a custom works EDM that I'm going to be throwing a late model body on and a custom works sprint car. The EDM is running a ball dif with a slipper eliminator and the sprint car is direct drive. I think direct drive will work best on carpet. If you have an old B4 lying around convert it over to oval. Find More Posts by Matt M.
Looks like we're 50-50 so far. Last winter I ran a few races on carpet with 17.5 blinky w/ball diff. and a couple guys told me the truck would corner better with a gear diff. New to this kinda truck stuff. 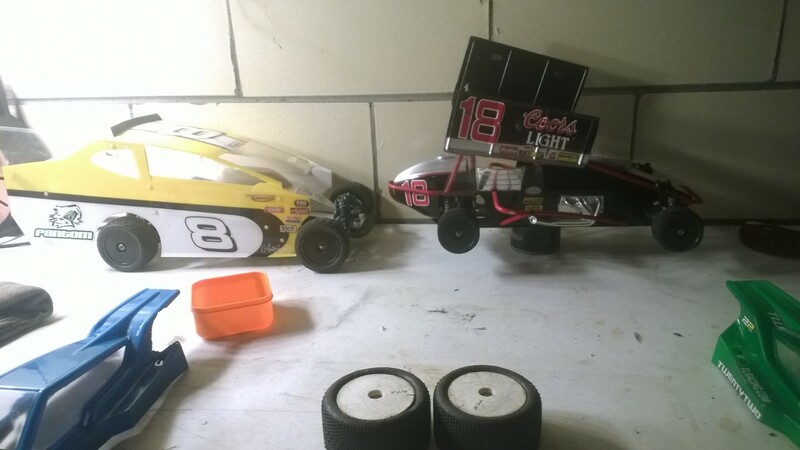 Here are the two cars I plan on racing this winter for oval. All the Oval cars I've owned where direct drive, but they still have ball diffs. I guess we stick with the ball diff. then. Thanks guys! Andy, if the track you are gonna run is anything like what Gregg's was in Wausau, you are gonna want the gear diff. Al and I both tore up the ball diffs and they didn't realy have that much of a performance advantage over the gear diff anyway. I ran a gear diff in my SC10 in the mod class for 2 years on the same diff and only changed oil in it at the begining of the season both times. Other than that it required no maintanence. I liked 7000wt oil in mine. Not sure what Al used. If/when I get a chance to try it, we'll start with the ball seeings how it's in there already. We have a gear diff w/new out drives on standby. Thanks Josh. All times are GMT -7. It is currently 12:08 PM.